Discussion in 'Team News and Rumors' started by LionNYC, Nov 12, 2018. Trying to avoid spoilers. Anyone have a link for the re-broadcast of the AIK match? Thanks. Though the link on that page seems to direct to the FCK match. When I click I get a page with the video embedded for the AIK match. Just don't scroll down below the video - there be spoilers down there with links to stories about the game and the score in the headlines. I just noticed that now. ETA: Never mind and thanks again. The video is below those buttons but doesn't show up in Firefox. Just opened in Chrome and saw the vid. Thanks!! Was just about to post a screen grab showing that. Enjoy! Vallos, Gotham Gator, Kjbert and 1 other person like this. I think Carlito is staying with Legia. If not he's kind of a dickish troll. Today's reports out of Poland say Carlitos is still "very interested" in NYCFC and that Nikolić has encouraged him to make the move. He missed the squad for Legia's game yesterday, and while the manager played it off as a coaching decision, Legia just signed a new forward. For some reason one of the articles claims the MLS transfer window closes this Wednesday, February 13, which doesn't reflect anything in the roster rules. 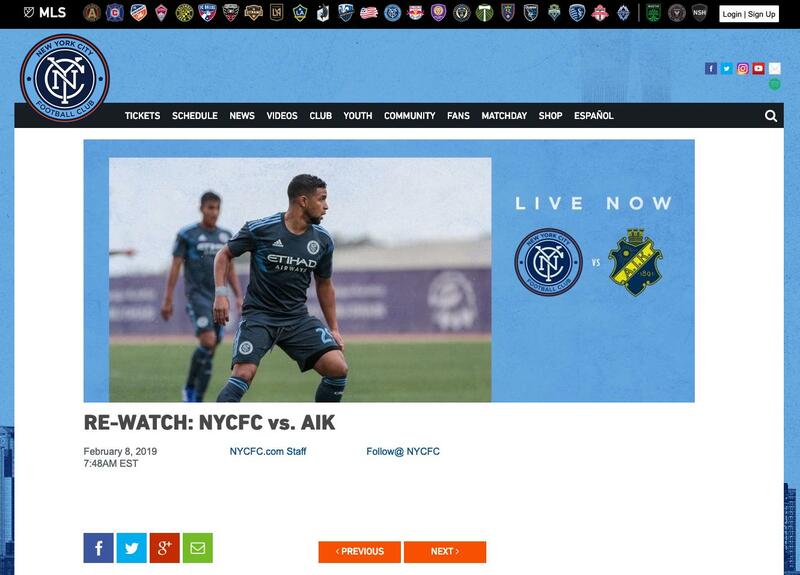 Maybe it's just bad reporting or maybe NYCFC set a deadline. On the other side, the editor of a large Legia fan site tweeted today that Carlitos has said he wants to stay and made this point on his Instagram but "can always change the decision after he was not in the match." Oświadczył w klubie, że chce zostać, że nigdzie się nie rusza i dał też to do zrozumienia swoim wpisem na Instagramie. Oczywiście zawsze może zmienić decyzję po tym jak nie znalazł się w kadrze meczowej, ale na razie nic o tym nie wiadomo. Carlitos wants to stay in Legia, the Legia authorities want to sell it, the coach has moved Carlitos out of the team. Carlitos can change his mind and leave. Christopher Jee, LostAnvil, adam and 10 others like this. Welp. All that digging this morning and now Legia's sporting director says on the official account that Carlitos is staying. The lesson, as always, is never try. SoupInNYC, danger, LionNYC and 4 others like this. "Carlitos is an important part of our team. In this window we are not interested in selling it. I believe it will help us to win the fourth consecutive Polish championship, "says Radosław Cook, sports director of Legia. Full talk tomorrow on http://legia.com. I agree the signs from both the player and from Legia are that he will stay, but neither has said so directly. This statement from the SD sounds like PR to counter the rumors that the club was pushing the player out because they want the cash, which probably made a decent portion of their fanbase upset. As far as we still know, the decision is up to the player as the trigger clause offer has been made. Until Lopez says "I'm staying," or the club says he told them he is staying and authorized them to publicize that, I think it's still an open question. SoupInNYC, Kjbert, FootyLovin and 1 other person like this. looking at the last picture on my phone, but it looks like there are two new players training on the bottom left. Happy Valentine's Day! Taty's old club is still in love. snugglefarts, Kjbert and Christopher Jee like this. snugglefarts, SoupInNYC, Schwallacus and 2 others like this. SoupInNYC, Schwallacus and NYCFC_Dan like this. That's a Cartier ring box. So he's blown a good amount already. Hmm maybe we shouldn't offer Gary Mackay-Steven a summer contract just yet. LionNYC, Midas Mulligan, Christopher Jee and 1 other person like this. 7 goals, but 4 were penalties? I’d say pass. But it’s wortying that this was a top target. I was thinking “hard pass”, regardless. But let’s hope his form stays poor so we won’t have to stomach this mistake. GMS, like a lot of wingers, can blow hot and cold. Was either sparkling or anonymous for the World Famous DUFC. I did watch a random game from a few years back though and seeing him in full flow was just superb and made me think that, at peak, he would be an amazing fit for our system with his ability to bamboozle and step away from defenders. In the way that someone like Lewis or ITS will get the ball, control it, look to do something.... in that time GMS and his magical wee rubbery legs have already gone past the defender who doesnt even know it yet. But who knows. Like I said when the rumour first came up, it's an open question whether he would significantly *improve* the current roster. I may be hedging more towards signing him purely for the curiosity factor of hving cheered him on [then him becoming a Judas] and then cheering him on at another team years later. Paul, Christopher Jee, SoupInNYC and 2 others like this. btw also just for random context - in his last season with us Gaz signed a pre-contract to join Celtic at the end of the season, then basically took a big huff with his boyfriend Stuart Armstrong ( ). Stu then jumps ship on the last day of the transfer window to Celtic, with us taking a token pay off to let GMS go with him immediately. Our season collapses, we basically never win again and one of our best periods as a club explodes spectacularly.